If there is one thing the British can be proud of as a people it is there understanding of the concept of charity. It is something they almost intuitively understand, the willingness to help those less fortunate and to support a cause that perhaps has affected a family member or friend. No other country, either worldwide or in Europe comes close to showing this benevolence and original approaches to raising awareness or donations are always welcome. 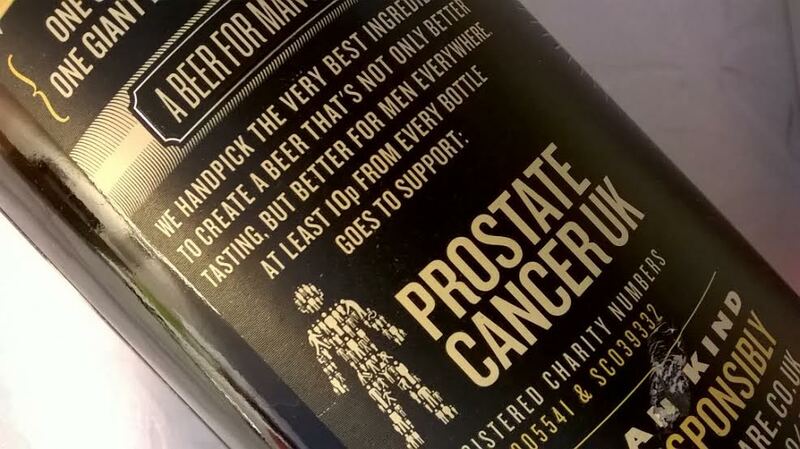 What better method then to raising funds than a bottled beer set to a particular purpose who's profits go toward a charity, and in this instance Prostrate Cancer. 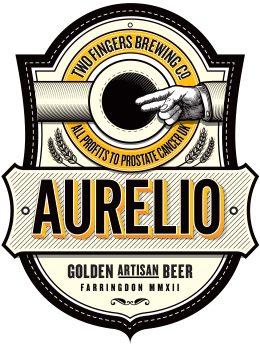 The beer in question is Aurelio (the Latin for 'Golden') an ale produced for The Two Fingers Brewing Company. The two fingers in question are not the 'Victory' sign made so famous by Churchill during World War Two, and not the more practical function required in testing to see whether men are susceptible to prostrate cancer ( one finger only here!) but in making a scornful statement of intent against the cancer itself! 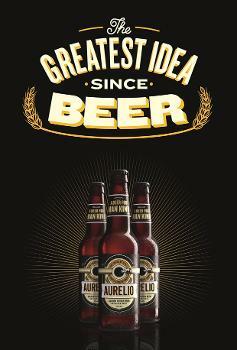 The beer is actually made by The Hepworth Brewery in Sussex, but sold under the Two Fingers Brewery Company moniker, a group of seven young men who felt passionate about bringing the the subject to the fore and who's backgrounds are in marketing. The company was formed in 2012. As their web site clearly states Prostrate Cancer is the most common cancer in men, which alarmingly by 2030 will be the most common cancer of all. 1 in 8 white men in the UK get prostrate cancer, and in black men 1 in 4. It kills one man every hour, that's 10,000 men a year. Stark reading, and something that needs to be addressed. 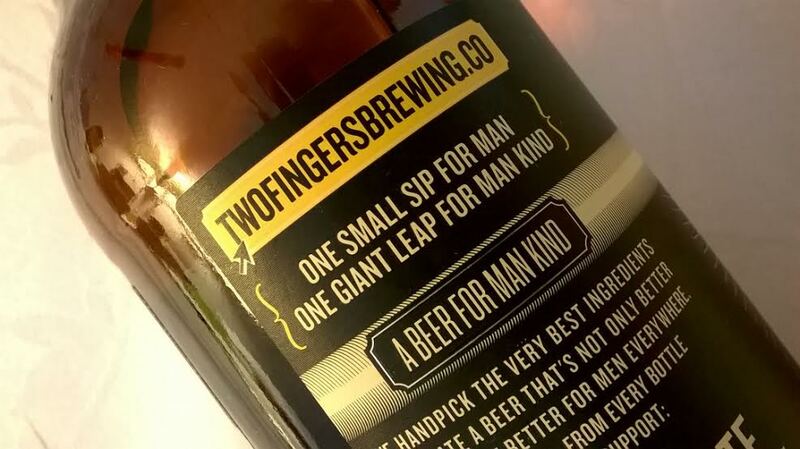 Of course it is the label that does the talking here combining wit with the more serious sentiment as to the beers mission. 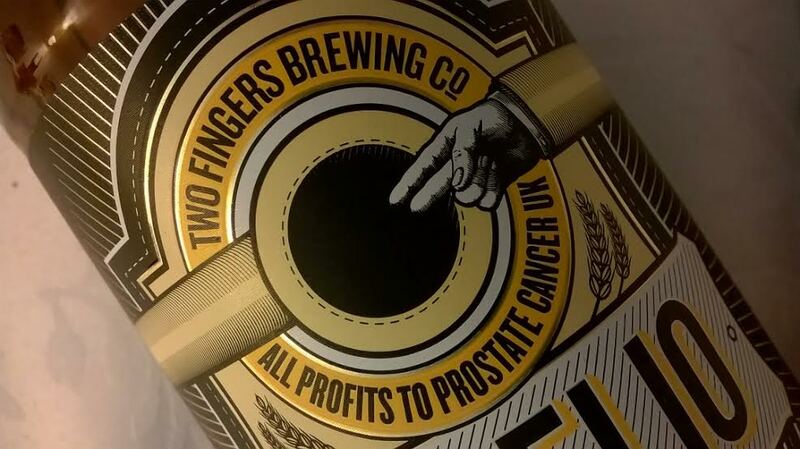 However the contents within are equally important as you want a beer such as this not just to be a one off purchase to raise the necessary funds, so a quality brew, with current appeal (and golden ales bridge the 'lager' 'ale' divide) is a good move. This then is a beer which carries a serious message with a feel good factor for those who purchase it...so scores on several levels. So the next time you see it's distinctive label on the Independents or Supermarket shelves its meaning will become more clear. Two fingers may be on the illustration - but one finger would be enough for the job in hand!